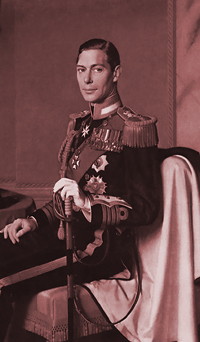 Albert Frederick Arthur George Windsor became King George VI on the abdication of the throne by his brother King Edward VIII in 1936 and was the reigning monarch of England during the Second World War. A somewhat reluctant King he oversaw the reduction of the British Empire under the Balfour Declaration and was an outspoken opponent of Britain's entrance into World War II favoring appeasement over conflict, a fact which he would be heavily criticized for. He died of Lung Cancer in 1952 at the age of 56, he held the throne 16 years and was succeeded by his daughter Elizabeth II.